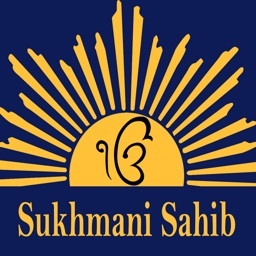 Sukhmani Sahib now in Gurmukhi, Hindi, English and also Translation in English. 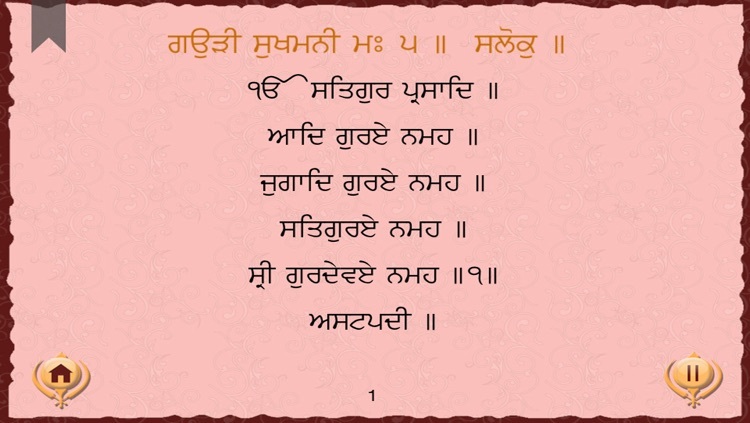 Each line is highlighted as the paath is recited. 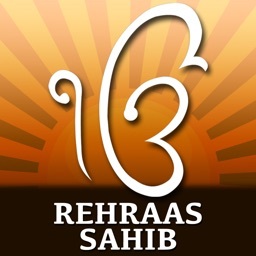 Mp3 Playback of Paath in the background when you don't want to read the paath. Increase / Decrease the Font. Love this App - This is exactly what i needed thankyou. Gauri to which it belongs. 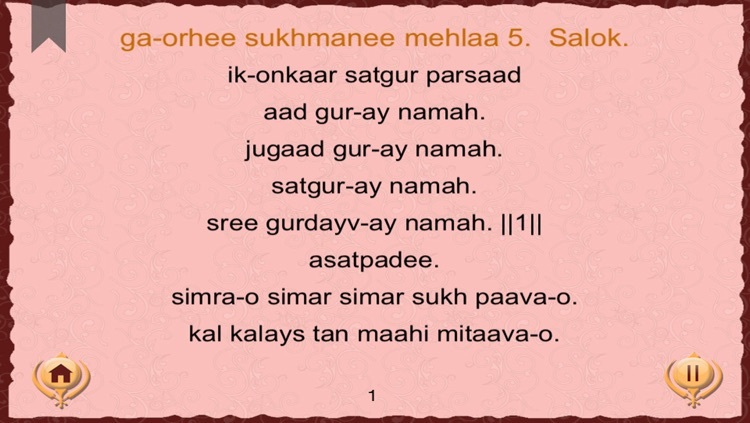 It is written by Guru Arjan Dev, the fifth Sikh Guru. (couplet) consisting of 10 Tuks (lines). 1. Sums up the benefits of contemplation and meditation. 2. Tells us that "practising holiness" reduces man's propensity to sin. 3. The Guru states that any study of holy texts, the performance of austerities. Etc. cannot compare with reading or listening to the Sacred Word. 4. Stresses the need for good behaviour. 5. We learn to thank God for all his various gifts and treasures which He gives us. 6. Examples God's gifts to man: a healthy body, delicacies to eat, silks and jewels to wear and pleasant music to hear. 8. 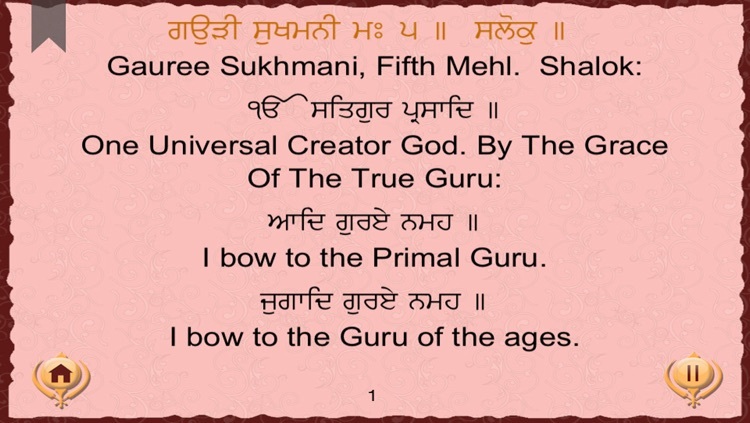 Similarly to 7, an appreciation of the God-oriented man- the Brahm-giani -is found here. 10. This deals with the various types of people and substances, both good and bad. 11. The Guru tells us that the meek and the humble win God's love, while the haughty and the vain find no peace or joy. 12. Dwells on the lot of the boastful and the arrogant. 13. Tells us of the need to associate with saintly people and of avoiding their slander. 14. Points out that mortals, by their very nature, are fickle and way-ward; so no reliance can be placed on them. 15. Just as darkness is dispelled by light, and wilderness is illuminated by lightning, the Guru's instruction opens up the mind. 16. The Guru refers to God as the Director, Playwright and Actor in His own plays. 17. 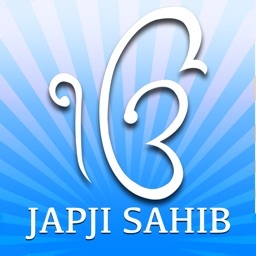 The Guru emphasizes the qualities of a true servant of God, namely obedience and humility. 18. Stresses the characteristics of a Seeker of Truth. 19. Guru Arjan warns of the distractions of life. Why waste one's life amassing wealth? 20. 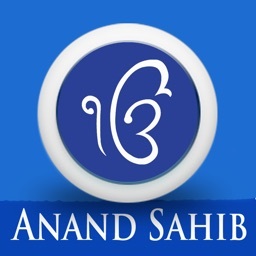 Deals with the need of efforts for spiritual progress. 21. The Guru tells of the pre-creation state. Before creation, there was a great void. 22. There is a short list of God's attributes. He is the fountain of generosity and goodness. 23. Tells us of the omnipotence of God. He created the fabric of the universe; he controls the stellar bodies. 24. 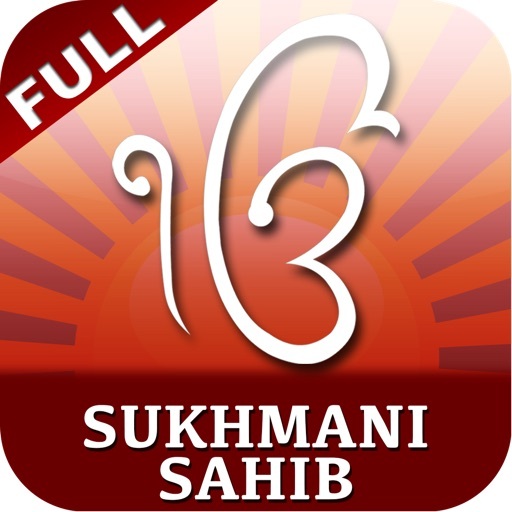 The benefits of the Sukhmani are expounded. The true devotee will be rewarded with health, culture, wisdom, peace, etc.